We spent our Saturday bowling with a group of animated guys celebrating a friend’s birthday. Beers, burgers and oily balls – what better way to spend an afternoon? The birthday boy regaled us with tales of his celebration dinner at Incanto earlier in the week leaving us hungry for something fresh and seasonal. He described a delightful sounding pea and mint risotto that inspired us to hit our Sunday farmer’s market in search of the best spring produce du jour. Peas and asparagus are iconic spring veggies abundantly available in our May markets. Pairing them with chopped mint and parsley, butter, freshly grated lemon zest and Parmesan creates an exquisite mélange perfect for creamy risotto. The May/June 2010 issue of Cook’s Illustrated provides an almost no-stir risotto recipe, and since risotto was on our minds we thought why not try out their cooking method, with a pleasant adulteration of spring vegetables? Fast forward to Monday and this was our lunch. Add a glass of wine or two and our week was off to a delicious start! Add the chicken stock to a medium sauce pan and heat to a simmer. In the meantime, add two tablespoons butter to a stock pot and melt over medium heat. Once the butter has melted add the leeks and a pinch of salt, sauté for about 4 minutes or until the leeks are softened. Add the minced garlic and stir for 30 seconds or until fragrant. Add the Arborio rice and cook stirring constantly for another 3 minutes or until the rice is translucent around the edges. Add the Vermouth and stir until all of the liquid is absorbed, about 3-4 minutes. Add five cups of the chicken stock, give the pot a good stir and put the lid on the pot. Cook over low-medium heat, covered for 15-20 minutes, stirring every five minutes, making sure the rice doesn’t stick to the bottom of the pan. Once the liquid is absorbed take the lid off the pot and add another ¾-1 cup of broth. Stir gently for a minute then add the asparagus and peas. Stir for a couple more minutes and add the Parmesan cheese. Remove the pot from the heat and let stand for 5 minutes. Uncover and add the remaining two tablespoons of butter, lemon zest, parsley, and mint; season with salt and pepper to taste. If the risotto is too thick for your liking, add ¼ cup more broth. Top with grated Parmesan cheese and serve. 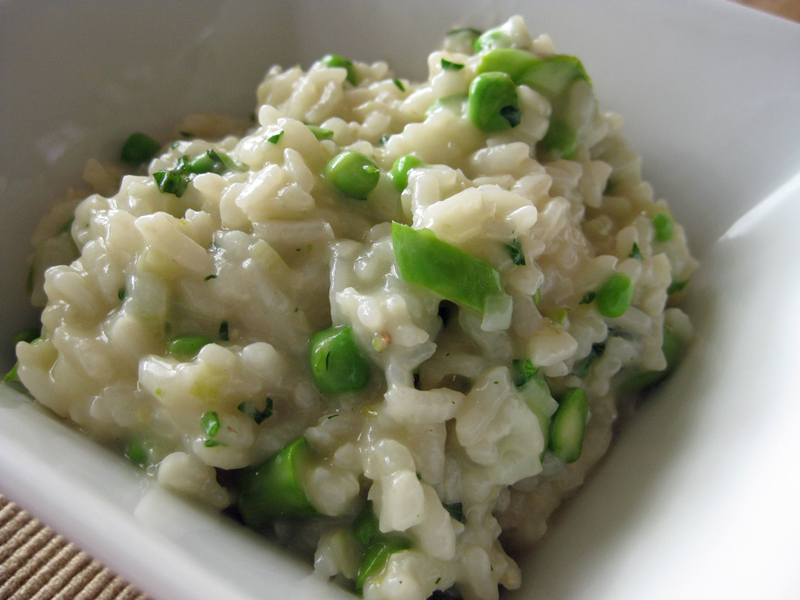 Leftover risotto can be reheated in a sauce pan on the stove, just add a little water or broth to loosen up the grains.